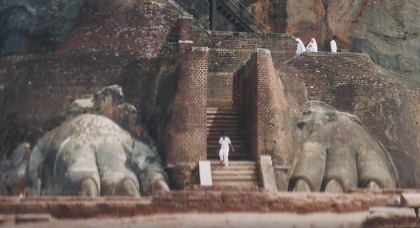 The Ancient City of Sigiriya holds the ruins of a former Sinhalese capital, including a rock fortress and palace. At the end of the 5th century, this enormous complex was constructed by Prince Kasyapa. Being in fear of an invasion, he tried to make it as impenetrable as possible. The site is also known as Lions Rock. At the level below the top, two very big lions claws give way to the final and most important stage of the complex, the palace. According to old descriptions, in the past you had to walk through the wide-open mouth of a lion to get there. 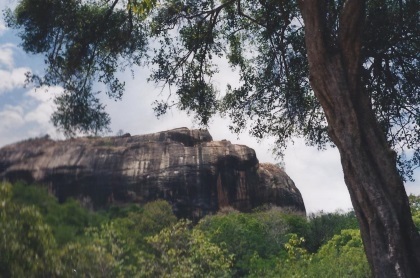 Halfway on Sigiriya-rock, you can see very special mural paintings. They are non-religious representations of women, of which some have been preserved very well. Some sources even say that the whole western face of the rock used to be covered with these paintings (of 500 women). The site in total is quite an experience. First you have to climb a number of stairs. You walk past the paintings of the women, an awesome sight in itself. Then you reach a platform where you can take a rest before the real hard work starts: between the claws of a lion an iron ladder reaches steeply upwards along the rock. Finally, on top of the rock, you see the site where the palace of the Prince used to stand (now only the ruins are left). I will say right away: this place isn't my favorite. It looks great on pictures, it's a must-do when in Sri Lanka, it has all the things of an epic day out, I was so looking forward to finally reaching it, or let's say reaching the top, but alas I was disappointed in the end. The climb is almost a tourist trap. There is a really tiny staircase for most of the way. There are always some tourists trying to get past you, there are always some tourists stopping on the way taking pictures of the not-very-special monkeys and thus EVERYONE needs to wait. This may be more of a rant towards tourists, so how about the rock fortress? The frescoes half-way up are great - I love it. Most people actually go here by mistake judging from their response when they have to turn back towards the stairs. I actually find this the best part of the climb. When you reach the top and look at the all the frustrated faces trying to line up going back down I knew I shouldn't have done it either. What you get is a pretty good view, I wouldn't call it fantastic in anyway, and some much needed wind in the Sri Lankan heat, but from what's left of the ruined fortress is absolutely a waste of time. Instead I should have spent more time in the museum but I figured I should first head up to the top and see it on the way down but who knew it takes 2 hours... and I didn't even spend any time in the gardens yet. Disregarding my frustration, the fortress' history is something worthy of world heritage status. The planning for the location and work put into it are impressive, and it shouldn't be missed on your tour, I just wish I had lower expectations for the climb. We travelled to Sigiryia from Dambulla by our rental car, it's an easy ride of about an hour. You can get inside the site by car, the parking spot is by the museum. The ticket price was equivalent of 30 US dollars per person, to be paid in local currency. You get a ticket with three tear off parts representing three checkpoints. It's a lovely walk towards the rock amongst the ruins, the site is well signposted with English explanations. The gallery of the frescoes is amazing and was my favourite part of the whole site. I had to admire the waspish waists and the perky breasts of the depicted women. On a more serious note, I highly recommend leaning closer and appreciating the amount of detail that went into the paintings. And then there's the whole large citadel on the rock itself, which you enter via staircase flanked by Lion's paws on each side. The views are wonderful and the whole area surrounding the WHS is green and tranquil. It's quite a steep and narrow staircase, so watch your step and don't wear flip flops as many locals do and then have them fall off. It's pretty hot there all year around, so prepare for sweat, wear sunscreen and have enough water. I really love this site. It's such a unique place and the story behind it is fascinating (a king going into hiding after he kills his father and steals the throne from his brother). But there's also a bit of an adventure to seeing Sigiriya. You can to climb up the different levels and that gives you a really close connection to the rock itself. The details along the way are really interesting and then the views and the broad picture from the top are wonderful. One of the highlights of a heritage trip to Sri Lanka. As of Jan. 2012 the Cultural Triangle Pass which cost $50.00 U.S. and was good for The World Heritage Sites was discontinued leaving the individual sites on per site ticket basis. Sigiriya admission is $30.00 If you chose to leave by the admission gate for rest spell at the air conditioned museum they will not let you re-enter. The ticket says good for one day but only if you make it good. All the food and beverage stalls are located at the parking area so if your going to spend all day here and want food do not exit the admission gate. 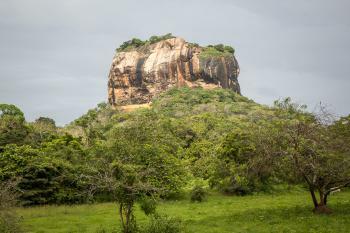 Sigiriya is an interesting site although its mostly just ruins around and on top of a hugh rock. Giant lion's claws greet the visitor half way up. The awesome head of this lion grand strairway entrance now is long gone. Before you get to this site you are funneled past the well preserved wall paintings of buxom maidens still in full color. This is a sight to see considering their skillful handling and preservation. People who are afraid of heights may not be crazy about going to the top. 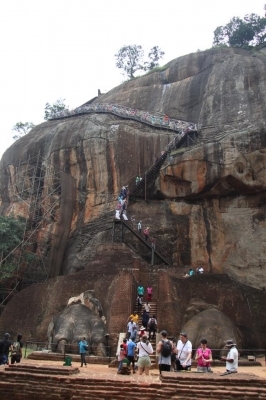 The steel constructed stairway in the rock is safe enough and well maintained and the views from the top are worth the effort. Wild elephants sometimes frequent the circle road area around the rock and Languar monkeys also live in the forest around the rock. A magnificent place! The frescos are just wonderful. We've been visiting (group of 20 people) Sri Lanka for 3 weeks in December 2007! An absolutely beautiful country with great places to visit. Unfortunately we were often the only tourists at those fantastic heritage places. People stay away because they are afraid of the Tamil war and to be honest there were many road blokkades on our trip to find. We haven't felt in danger though, not for one minute! Our guide kept in daily contact with his office so we were in perfect safe hands. 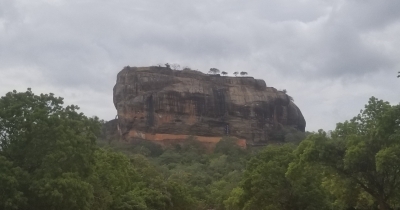 The Sigiriya rock took our breath away. It was raining cats and dogs that day which made the rock look very colourful. The view from the top was absolutely fantastic even it was hidden behind a curtain of rain! The history of the rock is fascinating. Sri Lanka is a country with loads of heritage places and lots of different landscapes. The 'frescoes' and the 'graffitti' on the mirror wall are a treat. 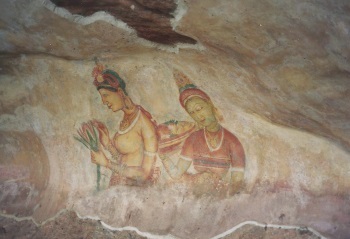 Initially there have been about 500 frescoes of the sigiriya maidens. But unfortunately the numbers have been reduced to many reasons. Built in the 5th century: ruins of 5th century capital, fortress etc. More than 500 steps to climb: Exact number of steps quoted varies but general agreement that it is over 1000. The summit is 200 meters above the surrounding plain so it seems inevitable that there must be well over 500! 159 Community Members have visited.